Five new satellites that will help keep the resurrected Iridium mobile communications system operating through the decade rode into space Monday aboard a Boeing Delta 2 rocket. Delayed three straight days, the two-stage rocket, fitted with nine strap-on solid-fueled boosters, roared off the launch pad at Vandenberg Air Force Base in California at precisely 1743:44 GMT (12:43:44 p.m. EST; 9:43:44 a.m. PST). High winds scrubbed Friday's attempt in the final minute of the countdown, troubles with a telemetry relay aircraft prevented launch on Saturday and a faulty fuel sensor was to blame Sunday. During Monday's countdown safety personnel were carefully studying the predicted impact area for the covers from the three solid rocket boosters that are ignited a minute into flight. Winds and other factors are taken into account to ensure the covers don't land on populated areas. But with just minutes left until launch, the Range said the situation was safe for launch. About an hour into the flight the rocket settled into an orbit about 345 nautical miles above Earth and begin deploying the five Iridium satellites one at a time. The final craft was released 85 minutes after liftoff, successfully completing the 290th Delta launch, the 101st for the highly reliable Delta 2 and first of 2002. It was the 12th time a Delta 2 rocket has launched satellites for the Iridium network, which provides global voice, data and paging services to subscribers around the world. From May 1997 through November 1998, 11 Delta 2s successfully launched 55 Iridium spacecraft during a record-setting campaign. 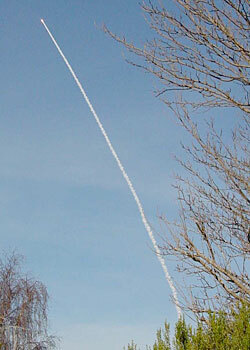 The rocket streaks to orbit as photographed by Delta launch team member Tim Madden. "We've teamed with Iridium since the early 1990s and the Delta 2 team is proud to add to the constellation again," said Jay Witzling, Boeing's vice president and deputy program manager for Delta. "I've been in this business for many years, and have seen many launches, but it's still a thrill to see the rocket fly and to place a customer's spacecraft successfully into its proper orbit." Monday's launch brought to 93 the total of Iridium satellites propelled into space during 21 rocket flights. In addition to the 60 spacecraft launched by the 12 Delta 2s, 21 satellites were carried aloft by three Russian Proton rockets and 12 flew aboard six Chinese Long March rockets. Remarkably, Iridium has never suffered a launch failure. The Iridium constellation relies upon 66 primary satellites working together in six groupings of 11 spacecraft each to cover virtually the entire planet from low-Earth orbit. The satellites launched Monday will join seven others that serve as orbiting spares, ready to replace any of the primary 66 as the craft age and fail in the future. By having the replacement satellites already in space, the spares are prepared to enter the constellation and fill any holes as they open up, keeping the Iridium system rejuvenated and functioning. Iridium says once the newly launched satellites complete in-space testing, they will be left in a "parking orbit" below the rest of the primary Iridium constellation until needed as replacements. 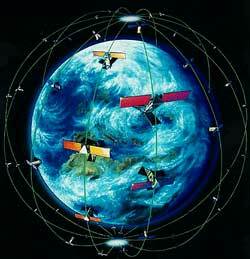 The lower altitude allows the satellites to drift to other orbital planes of the constellation, Iridium said. Two more spares are scheduled for launch in June from Russia using a Eurockot booster, which engineers believe will ensure the Iridium system remains healthy through mid-2010, much longer than originally designed. "In the past two years, the constellation has not required the use of any in-orbit spare," said Dannie Stamp, chief operating officer of Iridium Satellite LLC. "Through a robust architecture and a highly-skilled team of operators and engineers, the reliability of the Iridium satellite constellation is far exceeding original design predictions." Iridium has lost 15 satellites in space due to malfunctions -- 11 are still orbiting and four have fallen back to Earth. The original Iridium company rolled out commercial service in November 1998, but failed to attract a sufficient number of subscribers due to the pricey $3,000 phone and $7 per minute airtime fees. Iridium LLC lapsed into bankruptcy in August 1999 and by spring 2000, without a suitable buyer found, it appeared the satellite fleet would be driven into Earth's atmosphere to burn up. The $5 billion system was rescued in December 2000 when Dan Colussy, an aviation industry veteran, purchased the assets of Iridium LLC, including the satellite constellation and the terrestrial network for about $25 million. 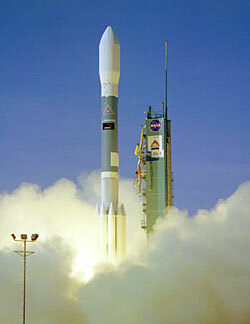 The miracle rebirth of Iridium was completed in March 2001 when commercial service was relaunched. The new company -- Iridium Satellite LLC -- debuted with cheaper prices and set out to target specific industries that it believed would subscribe to the system for communications to remote areas of the planet where terrestrial telephone networks do not exist, like construction, emergency services, maritime, mining, forestry, oil and gas and aviation. The U.S. Department of Defense is an existing Iridium customer under a multi-year contract for unlimited airtime for up to 20,000 government users. For Boeing, attention now turns to a pair of launches scheduled for the second-half of April. NASA's Earth observing satellite Aqua is scheduled for liftoff on April 18 to continue a string of four straight Vandenberg launches for the Delta 2 family. A Delta 2 rocket is then slated for blastoff on April 29 from Cape Canaveral Air Force Station in Florida to deliver a replacement Global Positioning System military navigation satellite into orbit. 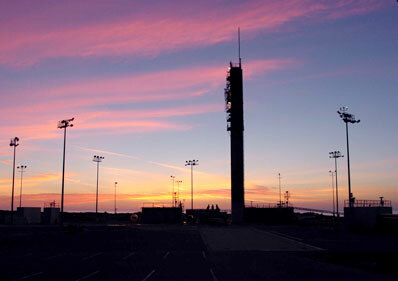 After four long days of launch attempts, the Delta 2 launch pad at Vandenberg is now empty following Monday's successful flight. Relive the Boeing Delta 2 rocket's launch from Vandenberg Air Force Base carrying five Iridium satellites in this 2 1/2 minute movie. An Air Force helicopter over Vandenberg Air Force Base captured this dramatic video of the Delta 2 rocket launching into a clear blue sky. A powerful infrared tracking camera shows the first stage main engine shutting down, the spent stage separating, the second stage ignition and jettison of the payload fairing during the launch. This narrated animation package details the flight of the Boeing Delta 2 rocket as it launches five Iridium mobile communications satellite. The Boeing Delta 2 rocket is assembled on the SLC 2-West launch pad at Vandenberg Air Force Base in California for this Iridium mission. Launch windows - Listing of the available times to launch in coming days. Iridium - Technical description of Iridium spacecraft.